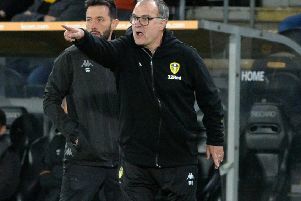 The win was more commanding than the final 2-0 score suggested as play-off contenders Preston barely struck a blow at Marcelo Bielsa’s men who went back into second place with the three points gained and handed the pressure back to rivals Sheffield United in their game against Birmingham tomorrow night. Goal hero Bamford came in for some heavy criticism after missing some big chances in the defeat at Birmingham and was far from his best in the first half at Deepdale, but came up with the goods with a terrific strike and a well placed header in the second half as Leeds’ superiority finally told. Preston were not helped when they went down to 10 men early in the second half with Ben Pearson sent-off, but in truth they were second best on the night and only managed sporadic attacks. The first half followed a familiar pattern with Leeds on top, but not making the most of numerous promising attacks. The first sniff of a chance went to Preston with Lukas Nmecha’s shot from a tight angle hitting the side netting off Kiko Casilla. But they were hardly seen in attack after this. United’s first opportunity fell to Ezgjan Alioski when he was found in the area by Pablo Hernandez following a break initiated by Tyler Roberts only to shoot weakly wide. A minute later Patrick Bamford’s first time shot in the box sent the ball over after he got on the end of Mateusz Klich’s pull back. Another good break ended with Hernandez cutting in from the right to send a left foot shot over from 20 yards out. Klich then came up with a great turn on the edge of the area, but his low shot sent the ball just wide. Preston keeper Declan Rudd was finally forced into a save, although it was an easy one to collect Roberts’ tame shot from just outside the box. Rudd made another comfortable save from Hernandez’s 20 yard shot and the first half ended goalless with the big travelling contingent of fans largely frustrated. A dramatic start to the second half saw Preston down to 10 men within four minutes as Bamford raced onto a long ball forward and was brought down by Pearson. Referee Robert Jones had earlier booked the home midfielder, but showed him a straight red card - Pearson’s third sending off of the season. The resulting free-kick almost brought a goal for Leeds as Kalvin Phillips’ 25-yard shot went just over. Roberts had a shot blocked from Luke Ayling’s pull back then got in behind the home defence only to pick out the wrong cross. Rudd saved, although he needed two attempts with Bamford sniffing. United finally went in front on 62 minutes when Bamford pounced on a loose ball and from 20 yards out beat Rudd with a powerful strike into the corner of the net for his eighth goal of the season. They were inches away from a second soon after as Ayling’s angled shot from inside the area hit the post. Another promising attack ended as Jack Harrison sent an effort well wide when in space on the edge of the box. Bamford then could not get a strong enough contact at the near post as he met Harrison’s low cross. Bamford did make it 2-0 in the 76th minute when free in the area to head home Klich’s lovely chip in after the midfielder had been set free by Hernandez’s fine pass. It could have been an even better night for Bamford as he ran clean through only to hesitate and stumble to miss a golden opportunity. Klich saw an injury-time shot comfortably saved by Rudd and Leeds saw out the closing stages just as comfortable for a vital win. Preston: Rudd, Fisher, Storey, Davies, Earl, Johnson, Pearson, Nmecha (Stockley 87), Browne, Robinson (Moult 58), Maguire (Ledson 70). Leeds: Casilla, Ayling, Jansson, Cooper, Alioski, Phillips, Hernandez, Klich, Roberts (Forshaw 83), Harrison (Berardi 77), Bamford (Roofe 90).